Access to that median cut will be shared with the property now owned by the county on which the Barber Creek Fire Station sits. The county plans to move the fire station and sell the property, possibly for another hotel. 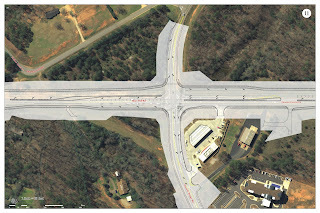 The fire station property has access to Daniells Bridge Road, and Commissioner Chuck Horton said at the meeting on Tuesday night that the county should consider providing a second exit to the proposed hotel and restaurant at the SR 316 and Connector corner via Daniells Bridge Road. 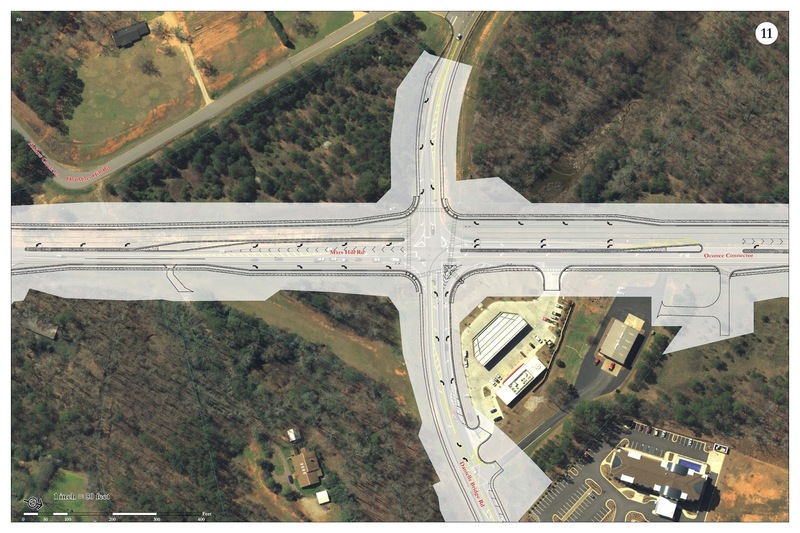 That secondary exit would allow traffic to turn south to Watkinsville and U.S. 441 without crossing traffic on the Oconee Connector that will be moving into double turn lanes for Danielle Bridge Road. In other action on Tuesday, the Board appointed members of several citizen bodies, including the Industrial Development Authority. The Board appointed James Brooke Toole, a general transportation manager with Walmart Supply Chain/Logistics in Monroe, to an open spot on the Industrial Development Authority and reappointed Rick Waller, currently chair of the Authority. Waller, owner of the Waller Agency Inc., an insurance company in Winder, lives at 1061 Springview Court off Daniells Bridge Road. Toole lives at 1070 Barnett Ridge, off Barnett Shoals Road, in the far eastern party of the county. Four people had applied for appointment to the IDA. The Board reappointed Jay Hanley to the Board of Elections and Registration and named Douglas Hammond to fill a vacancy on the elections board. Hanley lists his address at 1480 Whippoorwill Road outside Watkinsville, and Hammond lives at 1210 Clotfelter Road in the west of the county. The Board appointed Angel Jackson, 110 Marshall Drive, in Watkinsville, and Brandon Van Wyk, 1042 Timber Mill Drive, off Mars Hill Road, to the Cultural Affairs Committee. Kate McDaniel, 1380 Brittain Estates Drive, outside Watkinsville, was reappointed to her position on the Oconee River Resources Conservation and Development Council Board. 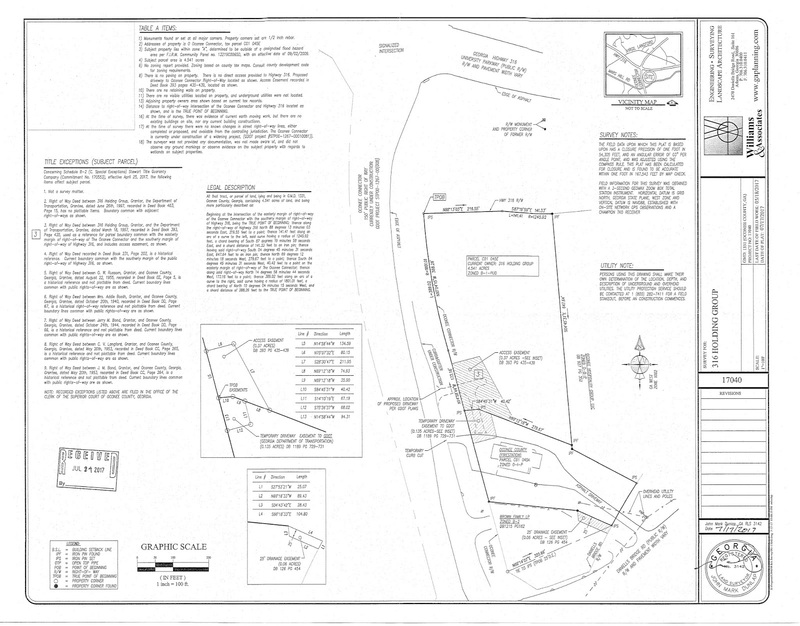 The Board of Commissioners approved a rezone request from the owners of 4.5 acres at SR 316 and the Oconee Connector and a variance request for development of the property. The property owners, 316 Holding Group, were asking for a change in the zoning of the parcel from one type or business use to another to allow for the possible development of a restaurant and hotel on the property. The property owners also were asking the county to set aside a restriction limiting building height on the property to 35 feet. The Board approved a maximum height of 55 feet. The vote granting the rezone and the vote on the variance were both unanimous. When construction of the Oconee Connector is complete, the property owned by 316 Holding Group will have a full median break, meaning that traffic from the property and the adjoining parcel now owned by the county will be able to make left turns onto the Connector. 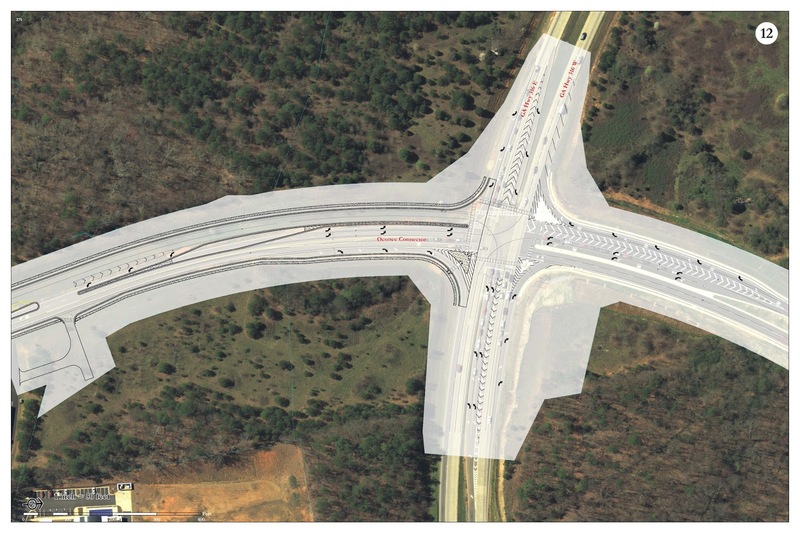 The median cut now being constructed by Georgia Department of Transportation contractors will be about two-third of the way between SR 316 and Daniells Bridge Road, meaning the left-turns out will be into the Connector where two lanes will be forming for left-turns only onto Daniells Bridge Road. At the meeting on Tuesday, I spoke in favor of the rezone and the variance but against the left-hand turns out of the property. Jon Williams of Williams and Associates, representing 316 Holding Group, disputed my interpretation of the plans. James J. McDonald Jr. of Athens is listed as the agent of 316 Holding Group. 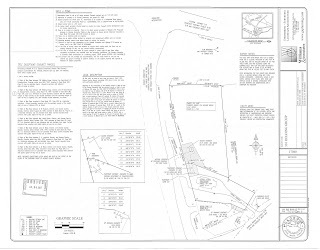 According to the maps of the roadway plans, given me by the county, the turn will be into the beginning of the two turn lanes to Daniells Bridge Road. In the first map on the right, above, of the median cut, yellow lines are shown where cars will begin to merge left. The second map is a blowup of the median cut. Emil Beshara, head of the county’s Public Works Department, told me the lines are “proposed yellow striping” in the roadway, not a barrier. Cars turning left onto the Oconee Connector will have to navigate across that area to reach a lane that is not turning left onto Daniells Bridge Road. 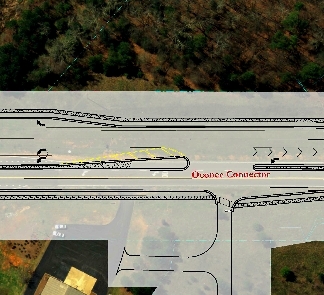 The third map, right, above shows the Oconee Connector intersection with SR 316. Commissioner Horton said his concern “is having just one way in and one way out” for the property owned by 316 Holding Group. B.R. White, director of the Planning and Code Enforcement Department, said the interconnect to the county property on which the fire station now sits could provide access to Daniells Bridge Road for the 316 Holding Group property. Williams from Williams and Associates objected to any restriction on the 316 Holding Group property that would force the owners to have access to Daniells Bridge Road. County Attorney Daniell Haygood said that, since the county owns the fire station property, it could mandate that a future owner provide access to Daniells Bridge Road for 316 Holding Group when the county sells the fire station property. The fourth map, right, above, shows the interconnected properties. The Board of Commissioners on Tuesday also approved bond purchase agreements for the sale of $15.4 million in bonds to fund expansion or the Calls Creek Wastewater Reclamation Facility and construction of an elevated water storage facility at Dove Creek Elementary School, now under construction. The money raised by the bond sales also will be used to pay off bonds issued for water and sewer projects in 2003 and 2009. The Board had approved the bond sales in a called meeting on Sept. 20, but the action on Tuesday night was to move forward with specifics of the sale. The video below is of the meeting of the Commission. The hearing on the rezone request by 316 Holdings Group begins at 16:45 in the video. OCO: BOC 10 3 2017 from Lee Becker on Vimeo.